The idea of Father’s Day was conceived slightly more than a century ago by Sonora Dodd of Spokane, Wash., while she listened to a Mother’s Day sermon in 1909. Dodd wanted a special day to honor her father, William Smart, a widowed Civil War veteran who was left to raise his six children on a farm. A day in June was chosen for the first Father’s Day celebration, June 17, 1910, proclaimed by Spokane’s mayor because it was the month of Smart’s birth. The first presidential proclamation honoring fathers was issued in 1966 when President Lyndon Johnson designated the third Sunday in June as Father’s Day. Father’s Day has been celebrated annually since 1972 when President Richard Nixon signed the public law that made it permanent. 70.1 million - Estimated number of fathers across the nation in 2008, the most recent year for which data are available. 24.7 million - Number of fathers who were part of married-couple families with children younger than 18 in 2014. 1.9 million - Number of single fathers in 2014; 16 percent of single parents were men. 211,000 - Estimated number of stay-at-home dads in 2014. 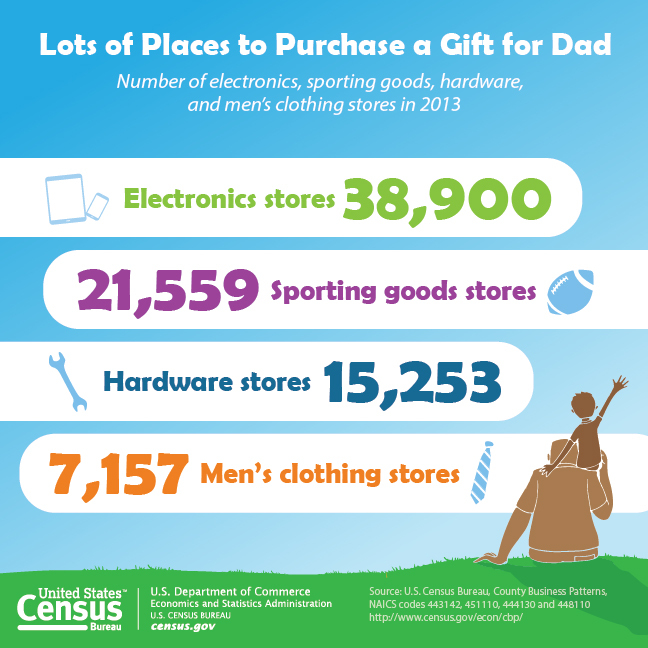 And as a cap-tip to us dear old dads, the Bureau and Department of Commerce has made the following infographic available to highlight the many and variegated avenues for securing a gift. See the full statistics here.